SPECIAL EVENT: For one night only, we'll be bringing a little piece of 60's Mayfair to Baker St. by recreating a visit to Jimi's flat. Listen to records Jimi would have enjoyed, hear live music from Tom Attah, bask in psychedelic lights, and relax in a pop-up version of Jimi's bedroom. There will be artefacts from Jimi's life to see, and a stall selling items only available at Handel & Hendrix in London. With introductions from Dr. Christian Lloyd, and a Q&A with Doug Kaye, who knew Jimi during his time living in London, this promises to be a night not to be missed! SPECIAL EVENT: Film to be followed by a Q&A Session with Billy Cox, bass player from the Band Of Gypsys and The Jimi Hendrix Experience. 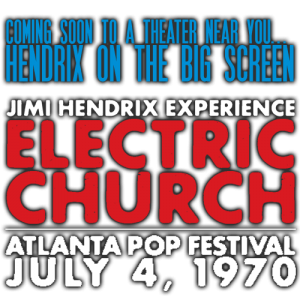 Billy stars in the film Electric Church and appeared alongside Jimi during the Atlanta Pop Festival. Moderated by music critic and author Ron Wynn. SPECIAL EVENT: Film to be introduced by Jimi Hendrix's sister and the film's Co-Producer, Janie Hendrix and will be followed by a Q&A Session with Producer/Director John McDermott, Music Engineer Eddie Kramer, Director Steve Rash, and hosted by 89.3FM KPCC's John Rabe. Jimi Hendrix: Electric Church presents the legendary guitarist in full flight at the 1970 Atlanta Pop Festival before the largest US audience of his career. This critically acclaimed film combined color, 16mm multi-camera footage of Hendrix’s unforgettable July 4, 1970 concert in its original performance sequence together with a new documentary that traces his journey to the festival amidst the dark shadow of civil rights unrest, the unrelenting toll of the Vietnam War and a burgeoning festival culture that drew together young people across the country who were inspired by the Woodstock festival.